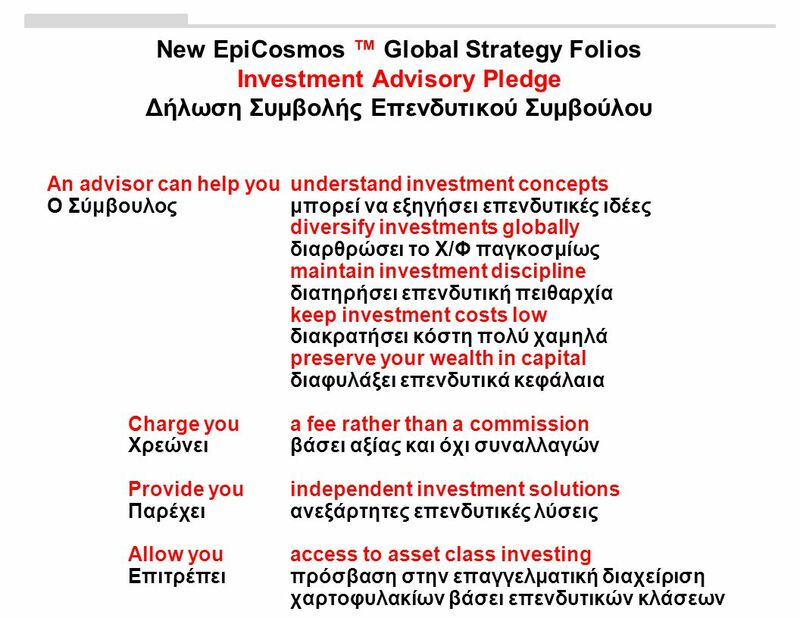 EpiCosmos™ Global Strategy Folios Διεθνή Χαρτοφυλάκια βάσει Επενδυτικών Στρατηγικών Epic ΑΕΠΕΥ Institutional-Quality Investment Portfolios Επενδυτικά Χ/Φ. 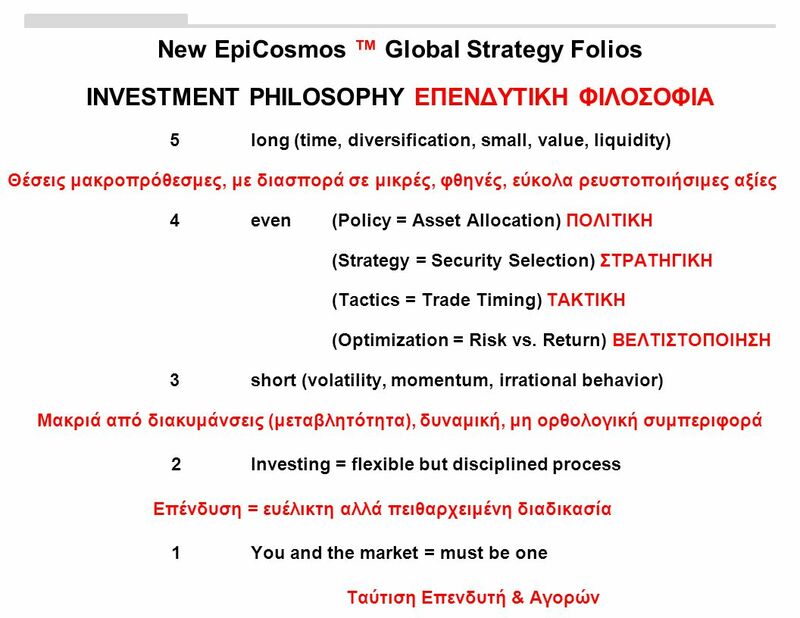 8 EpiCosmos™ folios: global strategy (risk model) based investments Εpic Επενδυτικές Υπηρεσίες ΑΕΠΕΥ Εσπέρου 96, 14564 Κηφισιά Τηλ: 210 7798510 Φαξ: 210 7777621 email:epic@epic.gr Δικτυακός τόπος:www.epic.grepic@epic.grwww.epic.gr Disclaimers Copyright DFA 2011. Unpublished. All rights reserved. This information may only be used for internal use, may not be reproduced or re-disseminated in any form and may not be used to create any financial instruments or products or any indices. This information is provided on an “as is” basis and the user of this information assumes the entire risk of any use it may make or permit to be made of this information. Without limiting any of the foregoing, in no event shall DFA, any of its affiliates or any other person involved in or related to compiling, computing, or creating this information have any liability for any direct, indirect, special, incidental, punitive, consequential, or any other damages (including, without limitation, lost profits) even if notified of, or if it might otherwise have anticipated, the possibility of such damages. 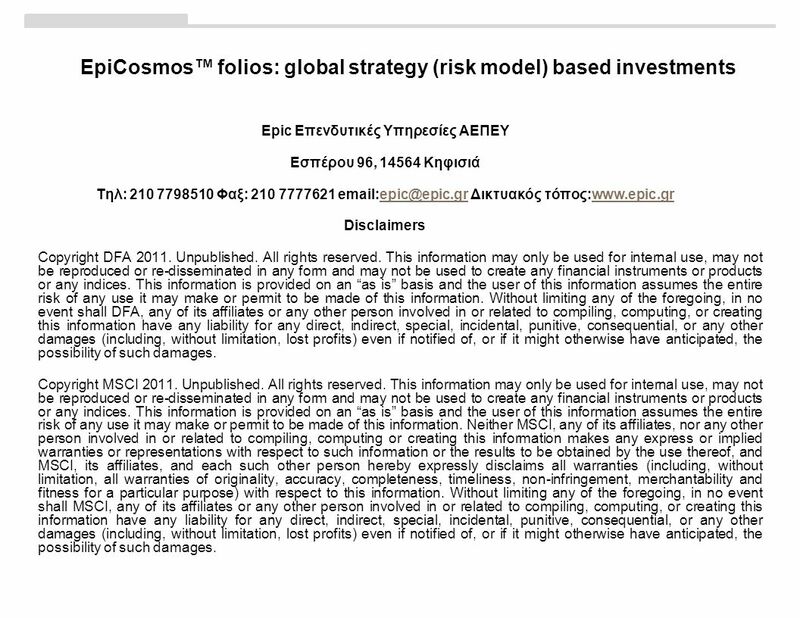 Copyright MSCI 2011. Unpublished. All rights reserved. This information may only be used for internal use, may not be reproduced or re-disseminated in any form and may not be used to create any financial instruments or products or any indices. This information is provided on an “as is” basis and the user of this information assumes the entire risk of any use it may make or permit to be made of this information. Neither MSCI, any of its affiliates, nor any other person involved in or related to compiling, computing or creating this information makes any express or implied warranties or representations with respect to such information or the results to be obtained by the use thereof, and MSCI, its affiliates, and each such other person hereby expressly disclaims all warranties (including, without limitation, all warranties of originality, accuracy, completeness, timeliness, non-infringement, merchantability and fitness for a particular purpose) with respect to this information. Without limiting any of the foregoing, in no event shall MSCI, any of its affiliates or any other person involved in or related to compiling, computing, or creating this information have any liability for any direct, indirect, special, incidental, punitive, consequential, or any other damages (including, without limitation, lost profits) even if notified of, or if it might otherwise have anticipated, the possibility of such damages. 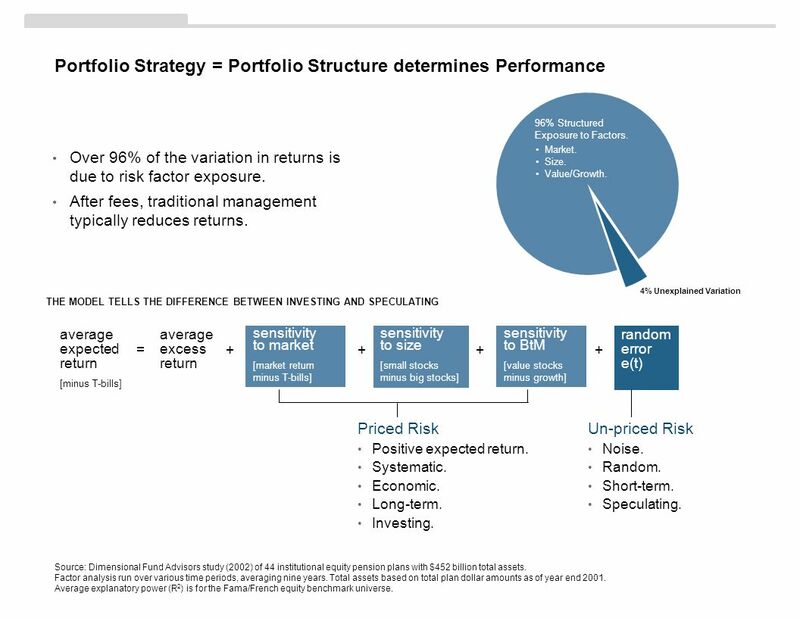 11 Portfolio Strategy = Portfolio Structure determines Performance Source: Dimensional Fund Advisors study (2002) of 44 institutional equity pension plans with $452 billion total assets. Factor analysis run over various time periods, averaging nine years. Total assets based on total plan dollar amounts as of year end 2001. Average explanatory power (R 2 ) is for the Fama/French equity benchmark universe. 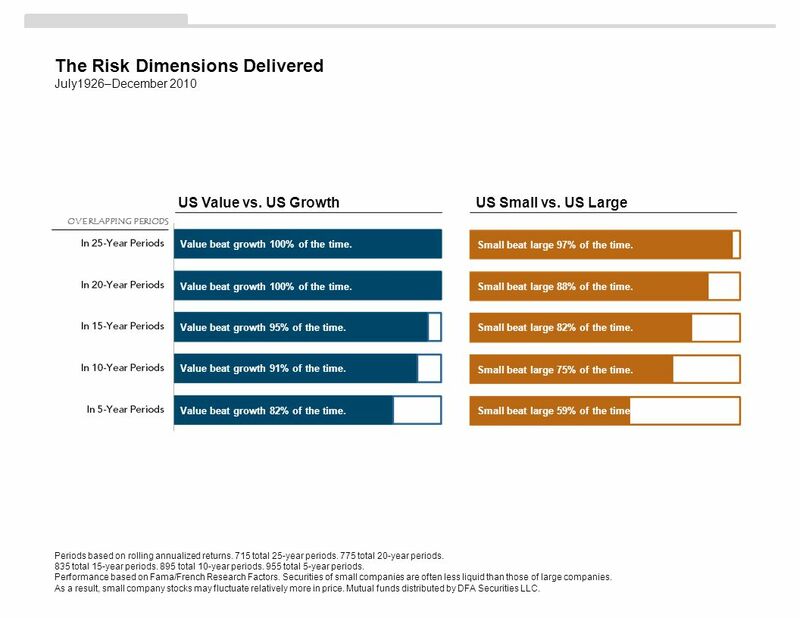 • Over 96% of the variation in returns is due to risk factor exposure. 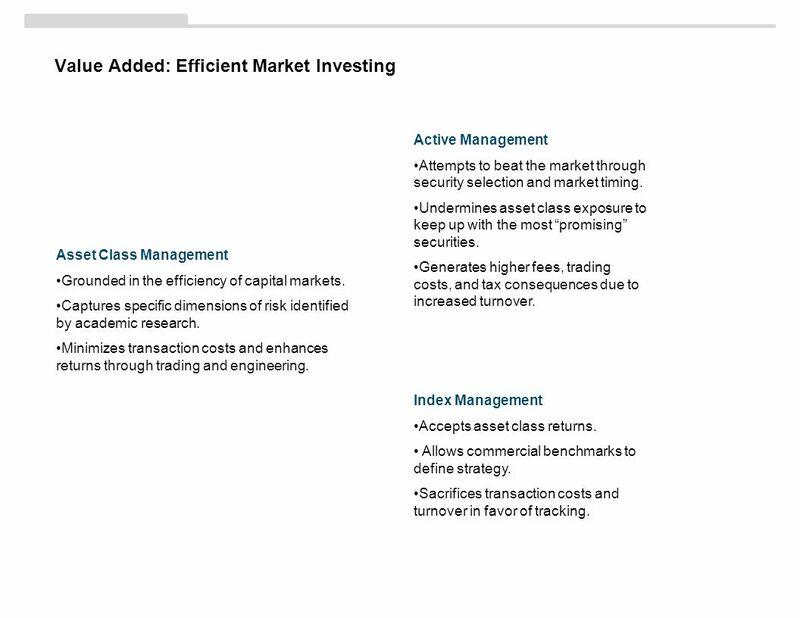 • After fees, traditional management typically reduces returns. sensitivity to market [market return minus T-bills] sensitivity to size [small stocks minus big stocks] sensitivity to BtM [value stocks minus growth] random error e(t) ++++= average expected return [minus T-bills] average excess return THE MODEL TELLS THE DIFFERENCE BETWEEN INVESTING AND SPECULATING Priced Risk • Positive expected return. • Systematic. • Economic. • Long-term. • Investing. 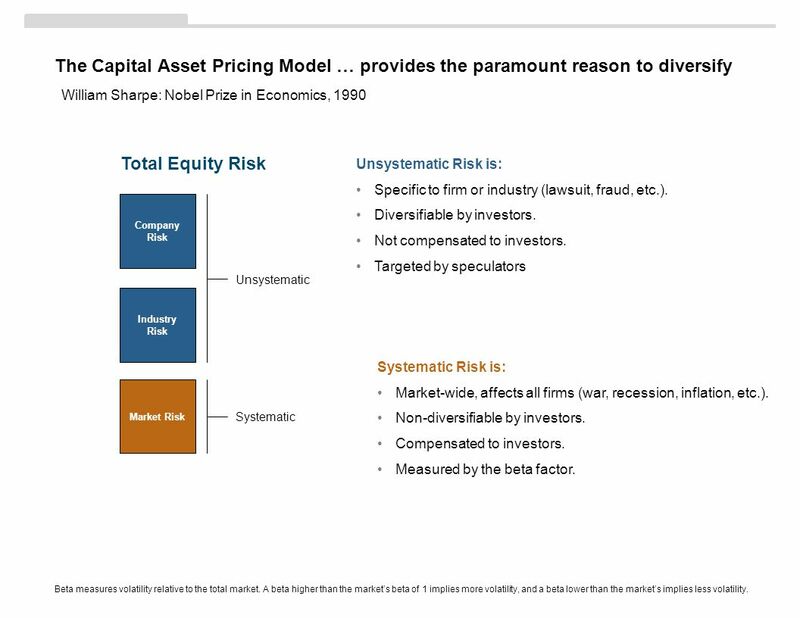 Un-priced Risk • Noise. • Random. • Short-term. • Speculating. 96% Structured Exposure to Factors. 4% Unexplained Variation •Market. •Size. •Value/Growth. 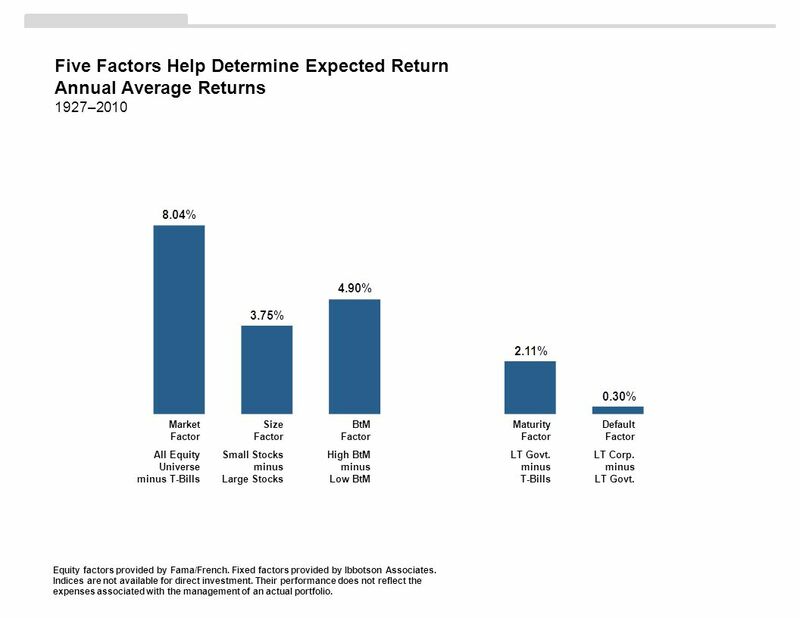 12 Five Factors Help Determine Expected Return Annual Average Returns 1927–2010 Equity factors provided by Fama/French. Fixed factors provided by Ibbotson Associates. Indices are not available for direct investment. Their performance does not reflect the expenses associated with the management of an actual portfolio. Market Factor All Equity Universe minus T-Bills Size Factor Small Stocks minus Large Stocks BtM Factor High BtM minus Low BtM Maturity Factor LT Govt. minus T-Bills Default Factor LT Corp. minus LT Govt. 13 Periods based on rolling annualized returns. 715 total 25-year periods. 775 total 20-year periods. 835 total 15-year periods. 895 total 10-year periods. 955 total 5-year periods. Performance based on Fama/French Research Factors. Securities of small companies are often less liquid than those of large companies. As a result, small company stocks may fluctuate relatively more in price. 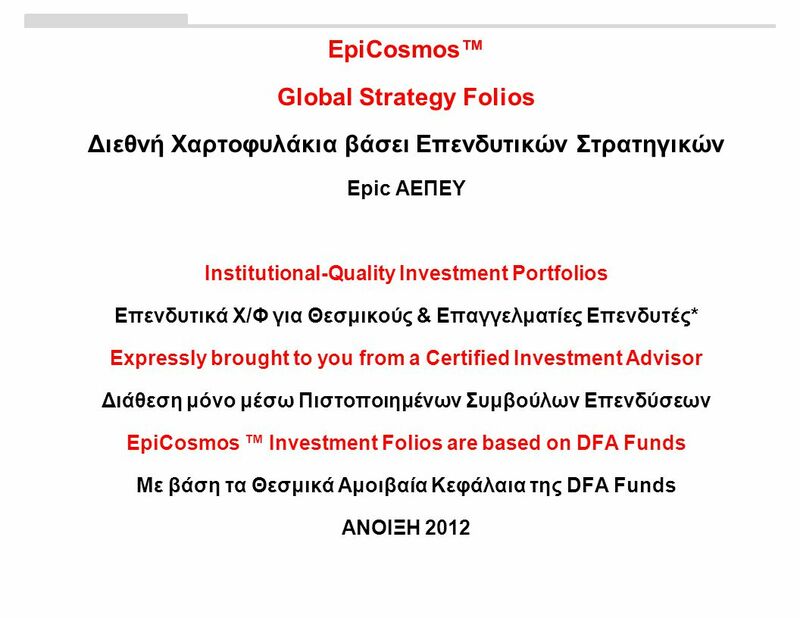 Mutual funds distributed by DFA Securities LLC. 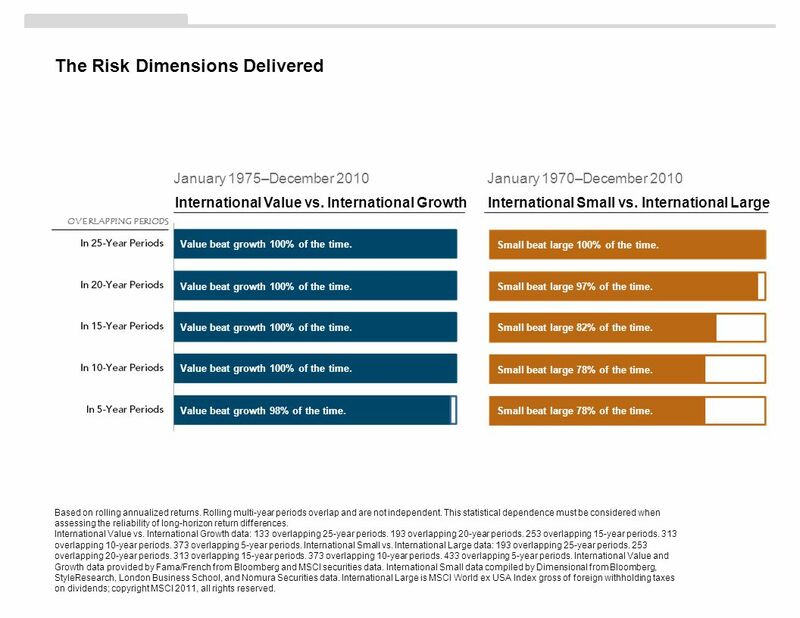 The Risk Dimensions Delivered July1926–December 2010 Value beat growth 100% of the time. Value beat growth 99% of the time. Value beat growth 96% of the time. Value beat growth 86% of the time. US Value vs. 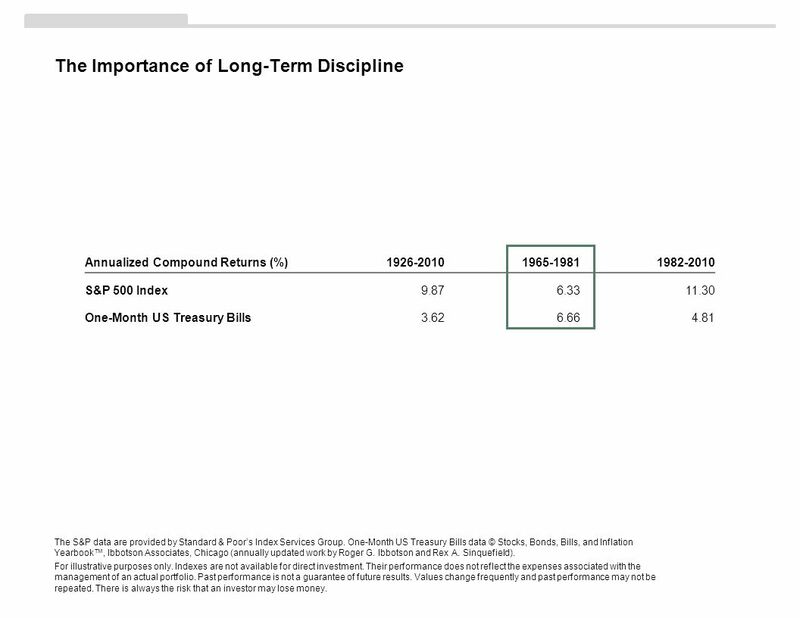 US Growth OVERLAPPING PERIODS Value beat growth 100% of the time. Value beat growth 95% of the time. Value beat growth 91% of the time. Value beat growth 82% of the time. Small beat large 96% of the time. Small beat large 83% of the time. Small beat large 78% of the time. Small beat large 68% of the time. Small beat large 60% of the time. US Small vs. US Large Small beat large 97% of the time. Small beat large 88% of the time. Small beat large 82% of the time. Small beat large 75% of the time. Small beat large 59% of the time. 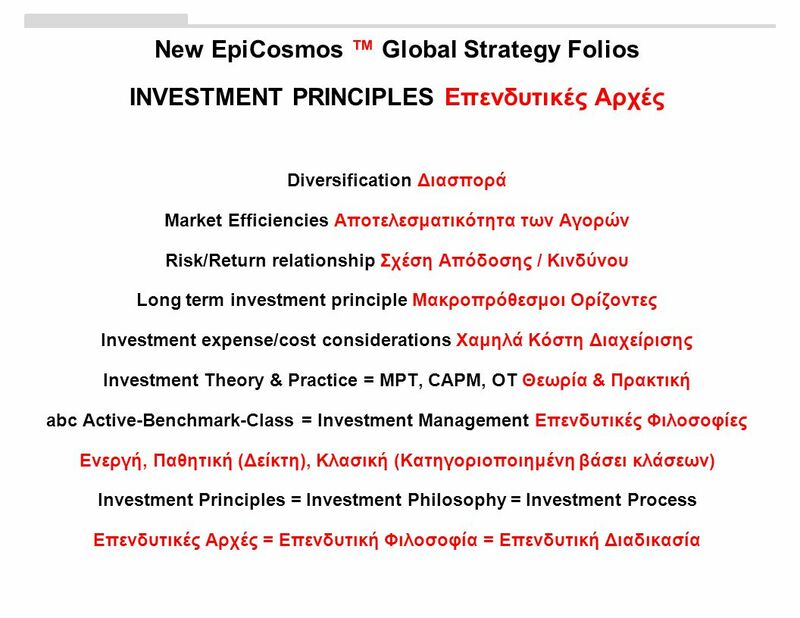 16 Value Added: Efficient Market Investing Asset Class Management •Grounded in the efficiency of capital markets. •Captures specific dimensions of risk identified by academic research. •Minimizes transaction costs and enhances returns through trading and engineering. 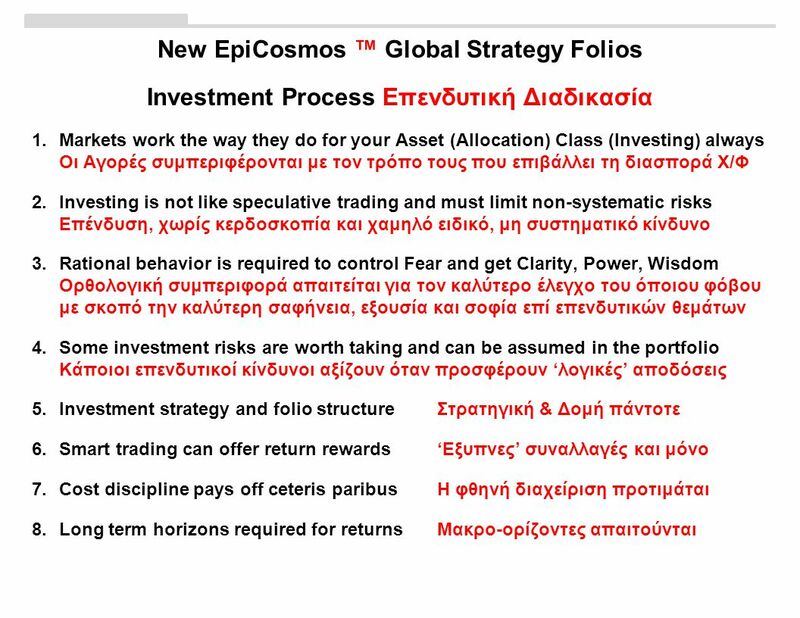 Active Management •Attempts to beat the market through security selection and market timing. 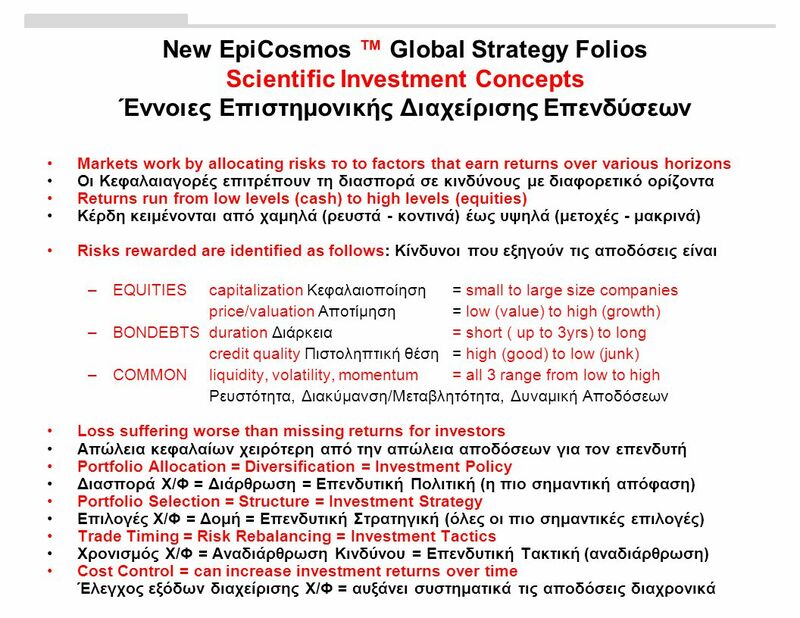 •Undermines asset class exposure to keep up with the most “promising” securities. •Generates higher fees, trading costs, and tax consequences due to increased turnover. 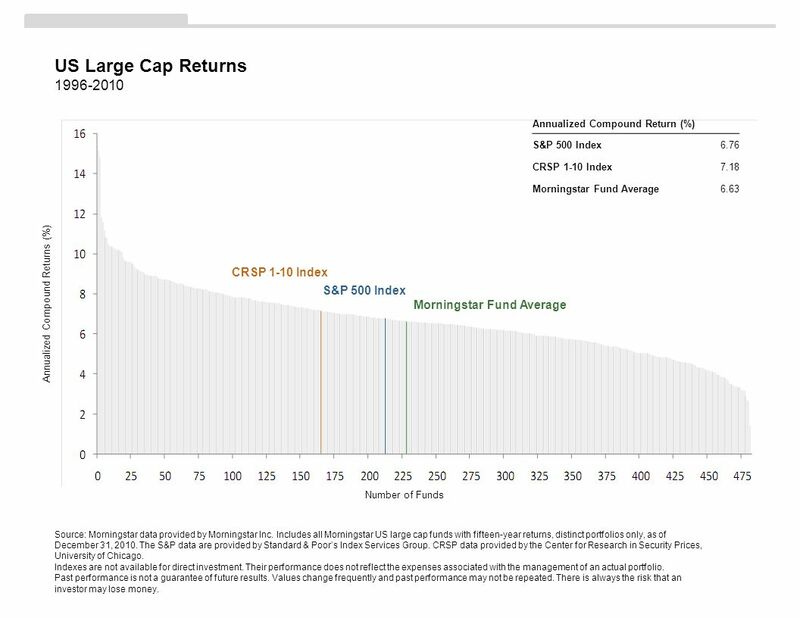 Index Management •Accepts asset class returns. • Allows commercial benchmarks to define strategy. •Sacrifices transaction costs and turnover in favor of tracking. 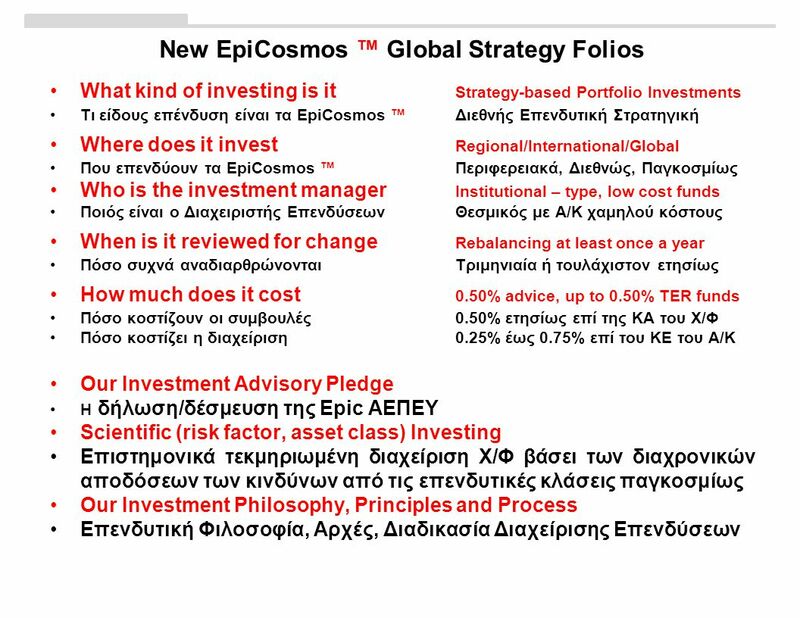 Κατέβασμα ppt "EpiCosmos™ Global Strategy Folios Διεθνή Χαρτοφυλάκια βάσει Επενδυτικών Στρατηγικών Epic ΑΕΠΕΥ Institutional-Quality Investment Portfolios Επενδυτικά Χ/Φ."